Catering for a Cause’s Institutional Food Services offers meal service to small to mid-sized schools, senior centers, and residential programs. Specializing in USDA approved menus, Catering for a Cause’s Institutional Food Service takes the guesswork and worry out of your food service needs and increases your client satisfaction, providing all the necessary menu planning, production reporting and service delivery. Catering for a Cause’s Institutional Food Service delivers satisfaction! Catering for a Cause is committed to our environment! For those customers who need disposable goods, we only use fully compostable, biodegradable or recyclable products. We purchase fresh local ingredients when available. We also compost all of our organic waste and can arrange to pick up any leftover food waste and recyclables. 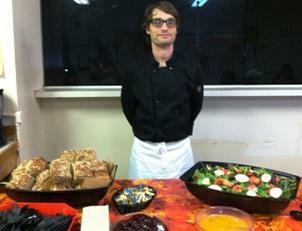 For more information on our Institutional Food Services, please contact DebraLorenzo at 503-972-9531.